Not raining tonight so lugged up the strimmer and did Maggie's plot down past the runners. Halfway through, Vincent appeared and asked if he could borrow it as their rather more expensive new one had died last week! Said ok but he had to remember to send me the society stuff :-) Moved on up to mine and really gave the paths a good going over, then delivered it to Vincent and was grateful his mate was happy to do it as by then I was exhausted. Chatted for a while and played fetch with the dogs (while keeping them out of the way of the strimming). Moved on to some hoeing ((I'm sure the weeds become invisible when I get out the hoes as they are way too big to have grown since last time!) and found that the lettuces are well up now :-) and so are the beetroot :-). I still have a tray of beet at home in modules but they never did look terribly happy, so glad I've a row coming up. 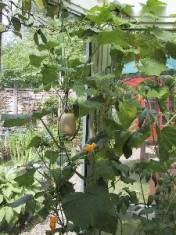 One of the eight-ball courgettes flowered today. Still no males. What a weird year - normally all the males come first. Gherkins in the runner beans doing well also, male and female flowers all over the place, though not sure if any of the females are actually growing! Picked the first gooseberries as they were getting big and I figured the bushes could do with thinning. And the pigeons are after them. Tied in a wayward new blackberry briar so it doesn't get hit by the council mowers (assuming they actually do the roads). The main briars are doing fantastically - not long to flowering now, and they are all very tidy for once! Slight rain and overcast after being quite clear for a time so decided to go. Lot of people up there trimming grass for some reason, though most with shears. Decided I couldn't offer to help everyone and nobody else had come and asked so went home. Postscript on equipment: I said when I first took on the allotment that I wouldn't buy lots of new tools immediately until I knew I was able to tend it successfully. Now I know what I'm doing a little more, I've bought the new modular hoes and I am so glad. In some ways I wish I´d done it before, as a sharp implement really does make a difference. Dad´s old hoe has had an honourable life and is perfectly able to hoe the beds at home now without having to be carted up and down from the car. The rake´s the same, though that will definitely get chucked when I can afford the Wolf Garten one. I haven't thrown the hand onion hoe as it´s useful and I have more raised beds, but for hoeing the onions without bending, the other one is far superior. Allotment inspection day. Went to allot when all was safely done in the company of Michelle and the kids. Found some oaf had trodden on my onions and some of the leaves have been ripped off. Thanks, whoever. Those onions were doing very well. Humph. Picked more rhubarb and more gooseberries and skedaddled. Sun, showers and thunderstorms. No need to go and water anything as a result. Spent ages reading through the RHS book in search of something to grow instead of the poor pecked/nibbled broccoli, given I don't want to buy them in with the risk of club root. Chinese leaf looks like a good bet, as do radishes. The rest of the plot can be a seed bed for next years spring cabbages. Which I am definitely going to sow in situ and very early! Lovely evening, though a bit cool. Took up the box of net that has been lurking under a table for ages, and used it to net the two most prolific old blackcurrants and the redcurrant. The old ones are now growing some wonderful new stools, as hoped for when I did the drastic pruning. Lots of the autumn onions are now bending over so I don't think they'll be far off being ready. All different sizes! Having bought a packet of one kilo Chinese cabbage seed on the way home, station sowed two rows. They need to be a foot apart and so it was easier to sow several seed at the correct spacing. Now all I have to do is wait and see if they germinate, and net them once they do. Also sowed more Nantes 5 carrots in the gaps in the previous carrot rows. Should also sow some more flyaway - may be another thing to do in the broccoli bed, once I've got some more compost for the drill! Weeded the pickled onions too, as they were getting a bit grassed off again. Spent quite some time tying in the beans and sweet peas again - the latter have finally put on a bit of growth and are now about a foot high in most cases. Have trained the ones in their own wigwam across to the next pole to compensate for the lack of height in that one (and hopefully to stop them shooting into the Bramley!) and may well continue to do this. The others will just have to argue with the beans. Most of them are doing ok now - the first flower buds are appearing, though obviously are very tiny! Moved on to the garlics and cut off the scapes of the Marco. Apparently you can eat them steamed like asparagus, or chopped like mild garlic-flavoured chives. Either way, it should mean the bulbs bulk up more before pulling and drying at the start of July. Went to church then afterwards, rushed up to allotment and watered there too. Much to my utter amazement, the chinese leaf has germinated and not frazzled in the heat. Yippee. Onions now getting very close to maturity: must lift a lot of them and let them dry out. I have a few spare courgettes and gherkins left to put in the gap, and also lettuces. Looking good. Up with hose to refill butts and water. Took an hour, as water pressure not very good again. Not helped by the leak in the old pipe segment. I really need to buy a new hose section. Anyway, pulled up seven onions as the house supply has run out and I saw no reason to buy any more now I've got ripening ones at the allotment. Only pulled those with bent foliage, so they're not going to get any bigger anyway. 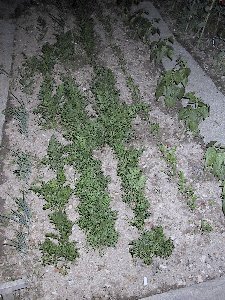 Foxes have been having fun in my Chinese leaf bed, but most of the seedlings seem to be ok. Must net it soon to stop them getting in again (and the pigeons). Blackcurrants are now going black on one bush - very early indeed. Just watered again. I'm getting through a waterbutt a night so hope it rains soon. The fruit bushes are doing very well now, as are the cabbages. 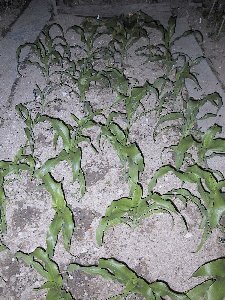 The sweetcorn have thickened up at the base and are now about a foot high, which is gratifying. Even the one that looked sickly is now happily growing. Spuds! Went to water and dug the first two plants. Got just under a lb in weight of spuds and a very chuffed moonbells. Took one of them and boiled it in a pan with a shop-bought Jersey and blind-taste tested them on P. He said very similar but liked mine better! (I think shop Jerseys are a bit bland this year for some reason.) And these are only the first two plants. With luck and some rain there's going to be lots more. What was even more amazing was the eight-ball courgette I also picked - the plant doesn't look big enough but still managed to grow my first of the season and it's only June. We so need a decent amount of rain, however. Beautiful, warm sunny day, of which I spent most in the back garden under a parasol with my nose in the new Harry Potter. Still dry as a bone, so up to allotment later to refill butts with hosepipe again. Water pressure somewhat better this time, so didn't take as long, but was still up there an hour as Chris and I noticed a pigeon had got into one of the fruit cages. We both felt it would not be fair on the owner to leave it in there, and the offender got itself helpfully caught in the netting as it obviously knew what was coming. Between us we pinned it and fished it out, then after some debate Chris carried out her threat to remove it permanently (she's lost all her peas recently). Luckily I wasn't watching. I now await feedback on how the pigeon pie was. Pulled a garlic in the green to stick on the barbie. Quite large bulb! Picked a handful of sweet peas too. I really like the raspberry ripple of the Kyle the Clown. Very pretty colours. Got lots of Red Ensign and Hard Times as well as one Dot.com. Looking forward to the oranges and lilacs and creams. Picked the butternut squash as it seems to have gone the correct colour for ripeness. Quite respectable weight (1lb 4oz) given it didn´t get pollinated! Didn´t go to allotment in the hope I wouldn´t need to water. About 8pm the rain finally arrived, and proceeded to chuck it down heavily for most of the night. Hooray. It was dry down about a foot, so with luck it now won´t be. Thinking on where I was this time last year and where it is this. First main annoyance: no broccoli courtesy of the blasted pigeons. Next year must net at the house as well as the allotment. Must see if the bought-in modules are in screened compost so I can buy some in. On the better side, all the marrows are off and running, where last year they were only just germinating. French beans were a dead loss at this point, where this year I have a nice row of dwarf beans (possibly yellow!) and flowering climbing beans (the flowers really are mauve!). Carrots are growing really well. Onions are growing really well. Leeks not as good, but I still have a couple of decent rows that are starting to take off. Might buy some to get a few more. Runners are doing really well. Garlics better thanks to early start. Sweetcorn about the same, despite later start, as they´re more compact. Beetroot not as far on cos I lost the modules to lack of watering (stupidly hot cold frame) but since I´d planted a row directly anyway, I think I´ll end up at the same place. Must thin them though! Cabbages same. Fruit: more raspberries (must net) and more currants. Fewer gooseberries. More rhubarb. Fewer apples. All in all, doing better. Got feedback from Chris: the berry-thief pigeon was plump and tasty, and surprisingly easy to prepare. I didn´t ask if it was gooseberry or currant flavoured. Midsummer Day. Hot again. Luckily the ground was still very damp after the downpours, and stuff is looking pretty good because of it. Took up the new box of 8mx4m netting and after a bit of a battle managed to get it over the top wire of the raspberry supports and down to the ground, in between the raspberries and the rather too close sweet pea and bean canes. Picked a handful of raspberries - yum! Pegged the ends down - maybe some birds will get in but at least they are now discouraged. 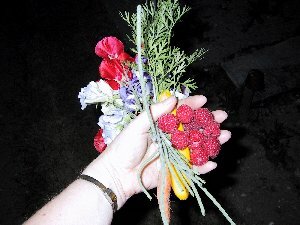 Picked a bunch of sweet peas - it seems the Lady Susan, Eclipse and Burnished Bronze are the ones that haven´t so far grown terribly well. Pity, but at least I have a silly number of the others to keep me going over the summer. By the time I got to take photos it was dusk, and so they are all with flash. Oops. Well at least they will look different to all the others - and the ghostly effect of using flash on the cabbages is quite worth it! Also picked another small yellow courgette and pulled a carrot carefully, to see if it was growing ok. Quite a respectable size too! Poddled up with trug and watering can, and had fun picking the first few blackcurrants. They aren´t really ripe yet, though, so I´ll have to wait another week or so (at this rate). Had a good go at the back of the gooseberries and found I still had more than expected. Picked two takeaway tubsfull, and then got some redcurrants off a neglected plot with Maggie´s help. Didn´t find my lost watering can rose, but fortunately I didn´t really need to water as the ground is still damp after Sunday. Marrows really starting to go now - I think they will be well ahead of last year. 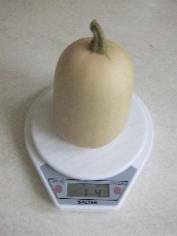 Slightly cross that what I thought was a yellow custard marrow (and was labelled as such) isn´t, though still not sure exactly which variety it *is*. So far Eight Ball is winning. Should have quite a lot of raspberries in the next week or two. Summer pudding looks like it is about to appear. 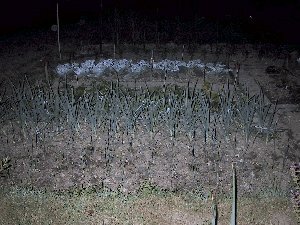 Up to allotment quite late (9-ish) just to check over a few things and plant the leeks I´d got from Chenies, in order to fill in the gaps. 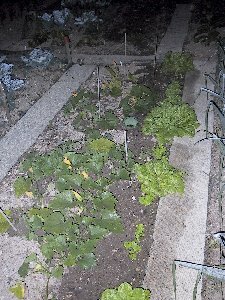 Unfortunately now I have verification of composts used in the Gardeners´ Kitchen brand, I now can´t get hold of the sprouting broccoli and Chenies isn´t getting any more in. Boo, hiss. I did notice a few other places with the brand round here so I will have to hunt about a bit. Picked a lot more redcurrants as I could see them, and then weeded the leek bed. Didn´t manage to get all of them in by any account, but I´ve filled in the gaps in the rows and added a few more at the ends so now have 36 leeks. And another 9 still in the punnet, so I now have an incentive to clear the autumn onion bed quickly! Got another bunch of sweet peas. I can see I´m going to have a lot this year.